Is it too early to start in with Eagles mock drafts already, considering free agency hasn't even begun yet? With the NFL Draft still three months away, am I only contributing to the absurdity of the NFL Draft build up? Am I part of the problem with offseason football coverage? I believe the following players would make sense for the Eagles for varying reasons no matter what they do in free agency. People love clicking on mock drafts, and I gotta get those page views, son. Could the Eagles find a way to use Thompson creatively if he were to be available at 20? On the one hand, this will be the Eagles' third year in Billy Davis' scheme, so they'll be much further along than they were two years ago. On the other hand, we're talking about a defense here that didn't even have a dime package until last offseason. Still, the way I see it, Thompson is simply too athletic to pass on even if he may not have perfect measurables for any specific position in the Eagles' scheme. Just go get him and watch him make plays. Like Shaq Thompson above, Smith is an extremely versatile player who can stand up and play the predator position in a 3-4 front as well as DE. At Mississippi State, the Bulldogs also lined him up at NT on obvious passing downs. Trent Cole could be gone this offseason if he and the Eagles can't come to an agreement on a pay cut. Even if they can work something out, he turns 33 in October. Meanwhile, Brandon Graham is almost certainly going to draw heavy interest in the free agent market, and the Eagles may have to make a tough decision on whether or not to overpay to retain him. Smith would give the Eagles some depth at multiple positions, and could eventually be a player that never comes off the field, while helping allow the Eagles to disguise what they're doing defensively. Around this time last year, Ogbuehi was given a first round grade by the draft advisory committee, but he decided to stay in school. Texas A&M has been looooaded with offensive line talent over the last few years. In the 2013 draft, the Jaguars took Luke Joeckel 2nd overall. In 2014, the Falcons drafted Jake Matthews 6th overall. Ogbuehi played guard when Joeckel and Matthews served as the bookends for the Aggies, he moved to RT when Joeckel left for the NFL, and then over to LT when Matthews followed. Unfortunately, Ogbuehi's season at left tackle didn't go as planned. He struggled at left tackle, before moving back to the right side, and then in the Aggies' bowl game, he tore his ACL. Ogbuehi obviously did not compete at the Senior Bowl, he won't work out at the Combine, and his 2015 season with whatever team drafts him will be in question while he recovers. For the Eagles' purposes, however, Ogbuehi would make some sense as a "redshirt" draft pick. The Eagles currently have a very good but very old offensive line, and they urgently need to reload with youth in preparation of an imminent decline from their offensive linemen. In other words, unless they surprisingly cut Todd Herremans or trade Evan Mathis, they don't need someone to step in and start immediately. They still have some wiggle room in patiently reloading with youth. Ogbuehi could be a first or second round type of talent who can be had in the third round. Gunter is a big, physical corner who will hit. He's 6'1 with 32 inch arms, has the demeanor the Eagles have looked for in their corners since Chip Kelly took over as head coach, and he moves better than expected for his size. At the Senior Bowl, there were several occasions in which wide receivers couldn't even get off the line of scrimmage, at all, with Gunter pressing them. Marpet comes from Division III Hobart, and in Chip Kelly's first two years in Philly, the Eagles have exclusively drafted players from big Division I schools. However, Marpet showed at the Senior Bowl that he belonged, and then some, which Marpet attributed to refined technique not normally associated with smaller schools. He also seemed like a high character kid who will interview well. Again, the Eagles have a glaring future need at guard, and Marpet could ease in once Todd Herremans decides to hang them up. There has to be at least one former Duck, right? Washington is a versatile linebacker who could serve as quality depth at OLB behind Connor Barwin at the "Jack" position, but also fill in at ILB in a pinch. 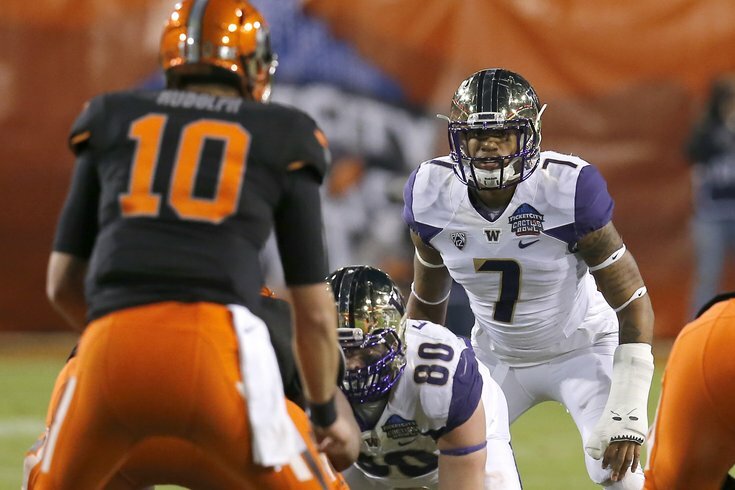 In his last two seasons at Oregon, Washington had 13.5 sacks and a very impressive 7 forced fumbles. He actually reminds me a little of a less athletic Marcus Smith but with a nastier demeanor. The difference is you can probably get Washington in the 5th round instead of, you know, at 26th overall. The Eagles have previously shown that they'll bring in massive offensive linemen with an eye toward grooming them, as evidenced when they made 6'8, 340 pound offensive tackle Michael Bamiro a priority undrafted free agent. Brown isn't a player who is going to help you immediately, but he has upside if the Eagles can develop him.